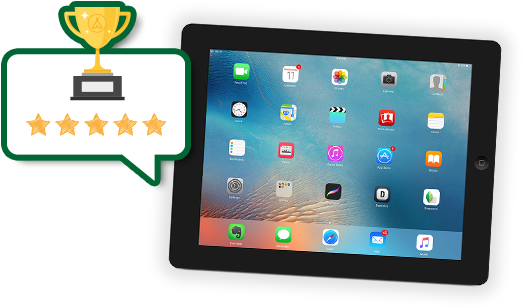 Share your review to win an iPad! Plenty of campers prefer to be prepared before going on holiday. You can help them by leaving a review. Because sometimes it's great, but sometimes you might be disappointed. Search for the campsite you visited by using the search box you see below. Choose your campsite from the list that appears. On the campsite page, you'll see a tab for 'Reviews'. Open the tab, and then click on 'Add a review'. Then let us know what you thought of the campsite! Don't forget to fill in the code you received! You can do this on the review form. Then you'll automatically be entered into the draw for an iPad! The information you've given is correct as far as possible. Your contribution is objective, not offensive, and you have not used any obscene language. You are not using the review system for commercial ends. ACSI reserves the right to remove your contribution, or to amend it without changing its essential content. Text referring to amounts, or referrals to parties other than ACSI will be removed from reviews. If you want to object to a review, you can do this by sending an email from this page. You have stayed at the campsite yourself, and your contribution is honest and objective. You use the name that you used to register at the campsite. References to other campsites are not permitted. The category opinions / customer reviews is not intended for questions and discussions. Your review should stand per se, and not refer to other reviews. Give a clear explanation. A clear explanation is necessary, particularly if your review is very negative or very positive. Each family or travelling group can leave one review per campsite per year. If you have visited multiple campsites, you can review them all. ACSI does not permit smear campaigns, or the initiation of smear campaigns against campsites. Your complaints will not be solved in this way, and it is not of added value for other campers. Please discuss complaints with the campsite owner or staff member first. If you want to inform ACSI of a complaint, you can use the contact form. 1. Who is raffling off the iPad? The Apple iPad is being raffled off by ACSI Publishing BV. 2. How will the winner be determined? The winner of this competition will be determined by means of a draw. At the end of the promotional period, one winner will be rewarded with an iPad. The winner will be informed via the e-mail address they submitted when entering the competition. Further information about the prize will also be via e-mail. Losers will not be notified. 3. Who can take part? Anyone who is older than 18 years old can take part in the competition. Employees of ACSI and their families are excluded from participation. ACSI reserves the right at any time to exclude those who (attempt) fraud from remaining in the competition and winning a prize. 4. What can be won, and how many prizes are there? By participating in this competition, you stand to win one Apple iPad. One iPad will be raffled off amongst the participants. The competition starts on 1 January 2019, and ends on 31 December 2019. After the competition ends, we will announce one winner. 6. How can I take part? In order to take part in the competition, go to www.eurocampings.co.uk , and go to the page of the campsite you want to review. On the tab 'Reviews' you can leave a review of your experience of the campsite. At the bottom of this page, you'll see the words 'Promotion code'. This is where you can fill in the promotional code. You can find this code on the competition flyer. Once you've filled in the code, you'll be entered into the draw for the iPad. 7. Can I take part multiple times? Yes, you can take part once for every separate review you write. After each review, you just fill in the same promotional code to be entered into the draw. All personal information obtained about participants during this competition will be handled in the strictest confidence and in compliance with applicable privacy laws. Participants understand that by participating in the competition, their names may be published by the organiser of the competition in the event that they are the prize winner. ACSI reserves the right to amend these terms and conditions (without giving any reason), or to cancel the competition.